Nicki Minaj performed a pre-recorded medley from her new album Queen in New York for this year’s MTV Video Music Awards. Among the songs she performed was the Eminem-featuring “Majesty” and “Barbie Dreams,” the Biggie flip that playfully disses rappers like Drake, Young Thug and Lil Uzi Vert among others. Minaj’s set was shot inside New York’s “the Oculus,” the artful subway station that was built at the site of One World Trade Center in the wake of the 9/11 terror attacks. Minaj, who just released the long-awaited Queen this past Friday, garnered some attention beforehand after she called out Travis Scott for allegedly gaming the system, after his ticket bundling deal put his recent album Astroworld at No. 1 in the upcoming week’s charts and held Nicki’s Queen at No. 2. The ensuing drama led to Minaj having her seat moved at the show to next to Ariana Grande and Pete Davidson to avoid any awkwardness—she had originally been seated next to Scott and Jenner. Scott also performed at the show. 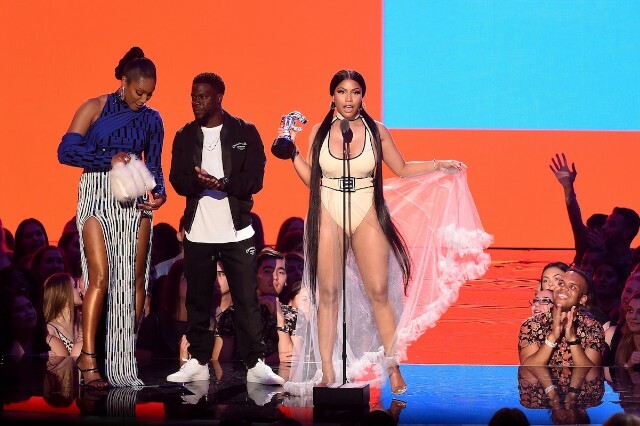 This is Nicki’s seventh performance for the Video Music Awards, she is also up for a “Best Hip-Hop Video” award for “Chun-Li,” which she won. Queen album. Watch the performance below.